Using two major book scripts to copy a single codex: in medieval manuscript culture this is far from routine. Still, MS Voss. Lat. Q. 1 seems to be the very embodiment of this unusual practice. The manuscript in question contains an alphabetized version of Dioscorides’ De materia medica. It belonged to a copy presented in several parts, but the others have all been lost, it seems (VLQ 1 contains the Preface and Acorus through Ficus maritima). It was made in or nearby the Benedictine abbey of Monte Cassino in the late eleventh century. This monastery is known for its high-end illuminated manuscripts written in Beneventan script. Thumbing through VLQ 1, however, quickly shows that this is not such a book. Not a single decorative element is encountered in the manuscript and the parchment is of particularly poor quality: some folia contain pronounced follicle patterns, translucent patches or a yellow discoloration; others contain cuts or gaps at the edge of the page. The manuscript’s most notable feature, however, is the mix of scripts on its pages. 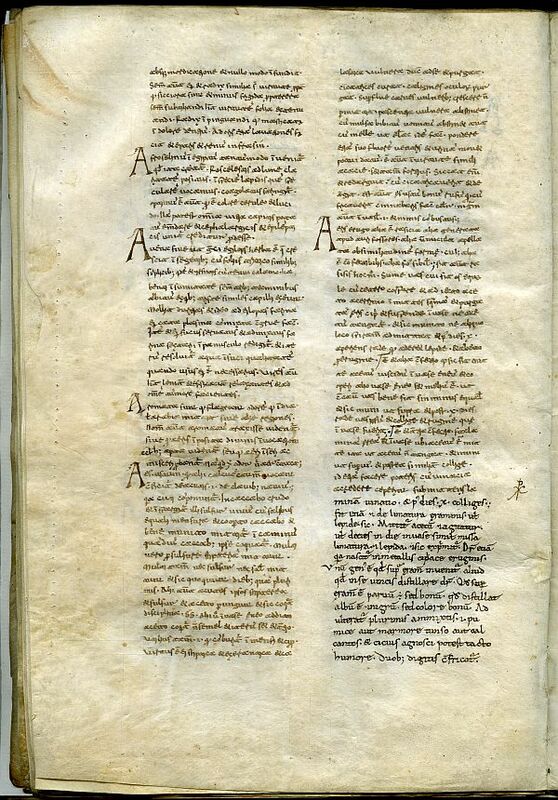 The first scribe, who copied f. 1r to f. 13v, line 36, includes such familiar Beneventan letter forms as the “a” that looks like “ac”, the enlarged “e” that looks like a “t” with a circle on top, and the “ti” ligature. Curiously, the two remaining hands in the volume used a Caroline Minuscule. The first of these takes over in line 37 of f. 13v, halfway through a sentence. The transition is marked by a “barred” capital “P” in the margin, contemporary and perhaps executed by the first hand. A third individual copied the remainder of the manuscript (f. 32v). The script suggests the first scribe was trained in the Beneventan zone (Monte Cassino and its surroundings); the others came from elsewhere. Thus, the Leiden Dioscorides is common but not ordinary: the object holds an every-day text that was produced under unusual circumstances, in a scriptorium where scribes from different origins found common ground in the books they copied.